From papermill to prime waterfront. One of Vancouver’s best waterfront views is getting a $1.5 billion makeover. The Waterfront-Vancouver USA project, a public-private partnership between the City of Vancouver and Gramor Development, Inc., will turn the former industrial site into a 20 block urban development with an additional 10 acres set aside for Vancouver Waterfront Park. When completed, The Waterfront will feature 3,300 residential units, one million square feet of prime commercial office space, and 250,000 square feet dedicated to restaurants and shops, including a new tasting room for Maryhill Winery, Twigs Bistro & Martini Bar, Wildfin American Grill and the Neapolitan Pizza Company. The development’s first four buildings are slated for completion in September along with the striking suspended pedestrian pier that extends out over the river. 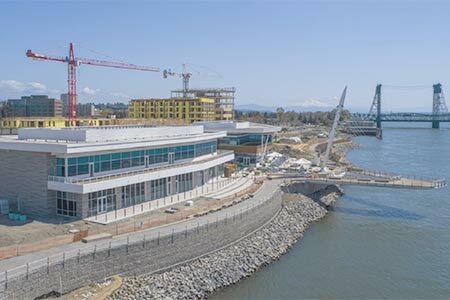 A new connection to the Columbia River Renaissance Trail that runs in front of the Grant Street Pier will connect city residents with their waterfront for the first time in a century. The land was originally used for industrial purposes, including shipyards and a paper mill, which was eventually closed in 1996. Read more about The Waterfront project.